This gouache and pastel on board painting was created by Bradshaw Crandell for the April, 1942 issue of Cosmopolitan magazine. The man in the Navy uniform was a young Yale law student named Gerald Ford, who would go on to become the 38th president of the United States. The beautiful blonde model was Phyllis Brown, college sweetheart of Gerald Ford, and one of Crandell's favorite models. This amazing combination that came together for Cosmopolitan magazine also caught the attention of Newsweek in 1978, when a story was written concerning Gerald Ford and Phyllis Brown's 1942 appearance on the cover of Cosmopolitan magazine. Bradshaw Crandell was born on June 14, 1896. He was known as the "artist of the stars". His models included Carol Lombard, Bette Davis, Judy Garland, Veronica Lake and Lana Turner, as well as many political figures. His first cover illustration was for Judge Magazine in 1921. He was known as a "glamour artist", and created covers for such magazines as Saturday Evening Post, Cosmopolitan, Colliers, Ladies' Home Journal, Redbook, Judge, Modern Priscilla, and College Humor, among others. 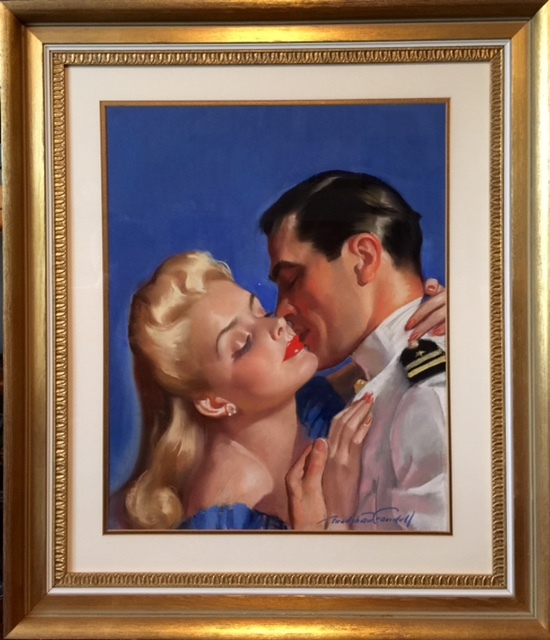 It was his 12 year run as the cover artist for Cosmopolitan magazine, succeeding Harrison Fisher, that made Bradshaw Crandell a household name. Cosmopolitan was known for it's covers that depicted some of Hollywood's most glamorous stars. Crandell also did calendar images for the Gerlach Barklow Calendar Co., as well as advertising images for numerous companies. In addition, he produced movie poster art for Twentieth Century Fox, and created a variety of art contributing to the war effort. In 2006, he was inducted into the Society of Illustrators hall of fame. Bradshaw Crandell died on January 25, 1966 at the age of 69.